Rome is a fascinating place to live. It’s all so different. Certainly some urban planning went into it, but not much. And while I must confess that I still get lost in my own seminary from time to time due to everything looking the same, I don’t think I’ve ever found two parts of Rome that look quite identical. 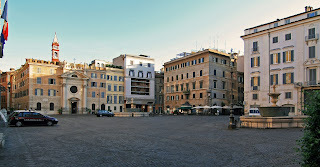 I love the streets and especially the cobblestones, but what I find most interesting in Rome are the squares – “La Piazza”. Each one is different, each one has its own flavor, its own flair. There’s Piazza del Popolo, sun-drenched and eccentric, the transition between the Rome of the pedestrian and the Rome of Fiats and Fords and Volkswagons, different every time you visit it. 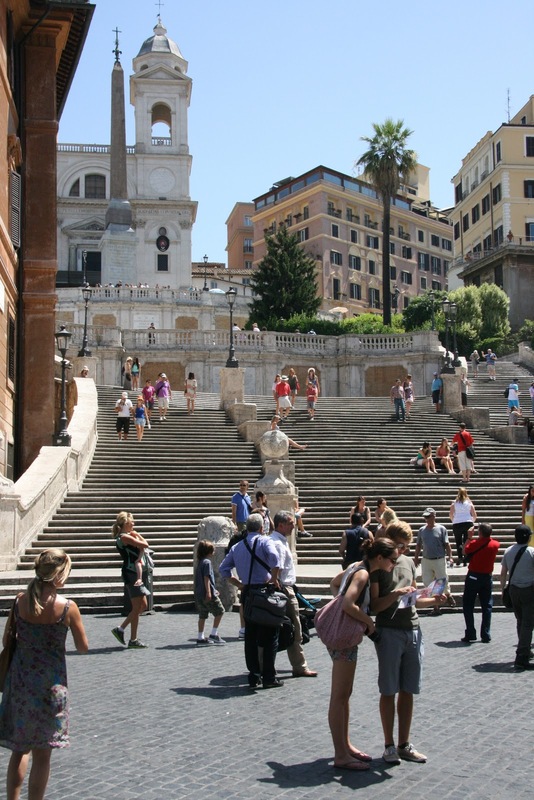 There’s Piazza di Spagna, bow-tie shaped and charming, with the world-famous Spanish Steps, surrounded by all the most expensive fashion stores, a marvelous meeting place or place to just pass the time, day or night. There’s Piazza Venezia, overshadowed by the gleaming-white marble mausoleum of King Vittorio Emmanuele: overflowing with cars and buses and thus every pedestrian’s worst nightmare. There’s Piazza della Rotonda, small and sloping, home to the Pantheon and located in the heart of ancient Rome: a stone’s throw away from basically everything. 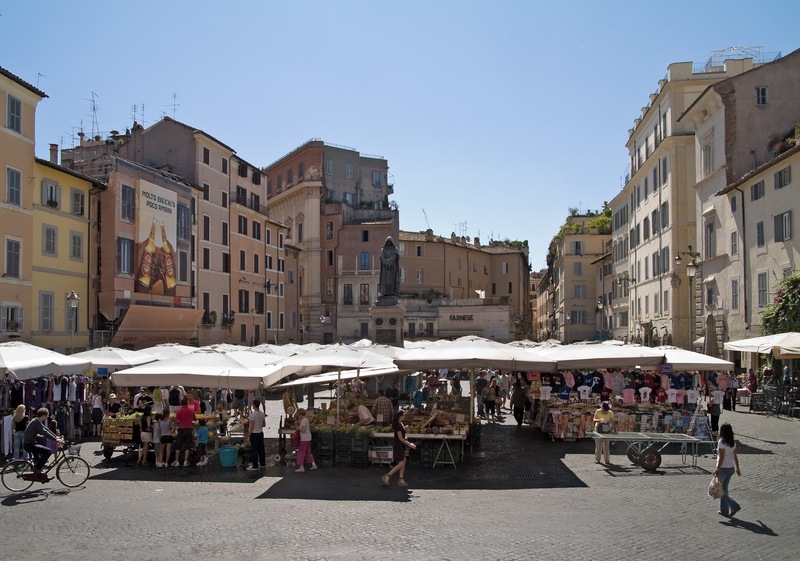 There’s Piazza Navona, cigar-shaped and almost always packed, filled with a carnival now, then a Christmas boutique, and later a political demonstration: home to some of Rome’s best street actors and swindlers. There’s Piazza Farnese and Campo dei Fiori, probably my favorite duo, Campo dei Fiori set as a market during the day, and then seemingly transforming into one big restaurant at night, and Piazza Farnese ever quiet, and solemn, and symmetrical, with two huge sarcophagus fountains and the imposing French embassy front and center. Piazza Farnese is the piazza where you’re most likely to find Roman boys playing soccer. Saint Peter's Square - a view from the cobblestones! Then there’s Saint Peter’s Square, probably the only place in Rome where you’ll never run the risk of being run over by a car; meeting place of the world, filled with people asking questions: “Where’s the Vatican Museums?” “How do I get into Saint Peter’s?” “How can I talk to the Pope?”; and hallowed as the place of witness of so many martyrs, from Peter the fisherman all the way to Blessed Pope John Paul II. Each Pope is different too, as different as the squares of Rome are different from each other. Each pope has his own charisma, style, and aura. 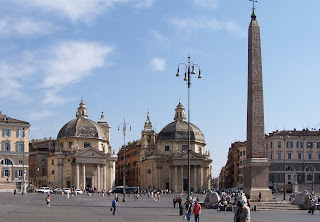 I’ve only known three Popes, but I’d say that Pope John Paul was most like Saint Peter’s Square. He was a tremendous communicator, connecting with billions through his speeches and his travels across the globe. He answered the questions of many through the witness of his life, even when suffering tremendously. He began his time as Pope with four bullet wounds, and he ended his mission persevering in his service even when it hurt. I’d say that Pope Benedict is most like Piazza Farnese. He is probably one of the greatest minds of the modern world, great not just in the sense of his great ideas, but also in his knack for giving them clarity and imparting them with humility. Initially labeled as haughty and unyielding, those monikers fell away the instant you saw his five-foot-seven frame in person. The first time I saw him, he reminded me of Santa Claus. While he may be given many titles in years to come, personally I think he should be called “Benedict the Good”. And Pope Francis? Which Piazza is he like? Piazza Navona, of course. If Benedict was down to earth, Francis is even more so. He has refused many of the bells and whistles, the frills and fluff of the papacy, just like many of the buildings ringing Piazza Navona seem to have refused being painted these last five hundred years. In his first 45 days as Pope, he has been one to go down and mingle with the people, purposefully inviting normal people to mass and not dining alone. 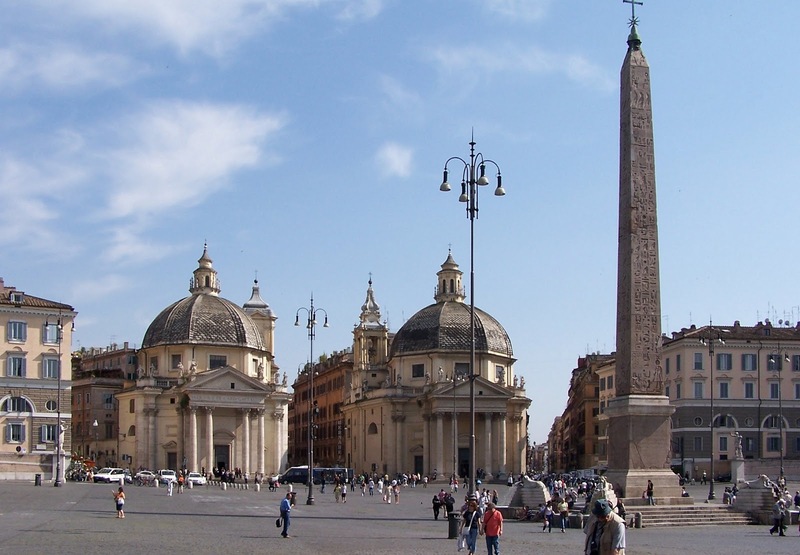 Of course, as a Cardinal, Francis stayed at a residence just off Piazza Navona, so maybe it was his favorite square too, who knows? It’s one of my favorite places to sit and watch people, get the pulse of Rome, and grab a gelato. Francis loves giving off-the-cuff homilies; maybe he drew a little inspiration from some of the magicians and comedians ever-present in Piazza Navona. Piazza Navona is always packed during the day, and Rome has been packed whenever Francis has appeared. Yesterday there were buses parked all over the city – more than I’ve ever seen before – for the confirmation mass Francis celebrated. In the weeks and months ahead, we’ll be getting to know Francis even better. Let’s be open to his message and teaching. Let’s keep him in our prayers, I’d suggest even making praying for Pope Francis a standard part of your day. PS- I've put all of these "cobblestones" messages together on a webpage, http://aviewfromthecobblestones.blogspot.com/ . Now that they'll be there too, if you'd like me to take you off my mailing list, please drop me a line. I don’t want to fill anyone’s inbox unnecessarily. PPS-It's two months to my ordination as a Deacon June 29th. Say a prayer for me too please!